Receive online payments through credit and debit cards from your attendees for their event registrations using QuickBooks. Need to Buy a Support License for the QuickBooks Payment Gateway for Event Espresso 4? A subscription for QuickBooks Online is required to use this payment gateway. Download the latest version of the QuickBooks payment gateway for Event Espresso 4 from your Event Espresso account page. Getting QuickBooks setup requires multiple steps including creating an app through the Intuit Developer portal, entering the credentials for your merchant account in the payment methods screen for Event Espresso, and then authorizing the app to allow processing of payments. We recommend that you first read through the steps below before getting started. This will help ensure that your QuickBooks payment method is set up correctly. 1) If you have an existing login for the Intuit Developer dashboard, then go ahead and login to the Intuit Developer website. If you do not have an existing login, then register and complete that process entirely and then login to your new account. 3) A window will then appear with two options. Look for Just Start Coding and click on the Select APIs button. 5) Your app will be created within a few seconds and then you’ll see the dashboard screen for your app. The dashboard is the hub for your app that will process payments for your website. From here, you’ll be able to access your credentials and make changes to your app. Note that there are settings for Development and Production. Development is used for testing purposes and production is used for live payments. Look for your account name / email address in the top right area of the screen and click on it and then click on Profile. Now update the information and save changes by clicking on the Save button. If your email address has not yet been verified, then go ahead and verify it. Your merchant account with QuickBooks should already be approved for accepting live payments. If you are not sure, then we recommend that you check with the support team at QuickBooks to confirm the status of your merchant account. 1) Click on the Development link from your Intuit Developer screen and then click on Settings. From this page, we’ll update some important information. Take your time to carefully update this information. 2) Click on APIs and place a checkmark next to QuickBooks and then Payments. Both should be checked. Then click Save. 3) Click on App Info and change the Application Name to something more memorable and easy to recognize such as “Testing app for QuickBooks” and click Save. 4) Now click on App URLs and then enter the information about your website. You should update the Host Domain, Launch URL, and Disconnect URL and then click Save. Disconnect Landing URL → Your actual domain name (e.g. yourwebsite.com). Your app can be disconnected and reconnected through your QuickBooks payment methods page within your WordPress dashboard. We recommend testing QuickBooks before accepting payments in live / production mode. Follow the steps below to connect your testing app to Event Espresso. 1) Click on the My Apps link, click on the app, then click on Keys. Your API keys are listed on this page. You’ll set the OAuth version option on the Event Espresso > Payment methods page to OAuth 1.0a. Now switch back to your other browser tab that has your OAuth Consumer Key and OAuth Consumer Secret and carefully copy and paste each into the respective fields (in your other browser tab). OAuth 2.0 users: You’ll set the OAuth version option on the Event Espresso > Payment methods page to OAuth 2.0. You’ll copy from and paste to the Client ID and Client Secret fields. Then under Redirect URIs, you’ll add a URL and copy and paste your website URL into the Redirect URI field. For apps in development, the URI can be localhost and can use HTTP. 7) A window will appear and ask you to log in. If you do not see a window, then your web browser may be blocking the pop-up window. Allow pop-ups in your web browser and try again. If you still do not see the pop-up, then try logging into your WP dashboard and returning to the payment methods screen for QuickBooks through an alternative web browser (e.g. Chrome, Opera, Firefox). Login securely using the same credentials that you used for the Intuit Developer site where your app was originally created. You may be asked to verify the account through email or another step. Go ahead and verify the account if requested. 8) You will then see a prompt to authorize the connection between your site and QuickBooks. Go ahead and click on the Authorize button. If you have multiple test companies, then select the correct company and complete the authorization. 9) Double-check that you now see a Connected status of green in the Connect to QuickBooks section of the payment methods screen. You can now begin testing QuickBooks for Event Espresso 4. We recommend creating a real event and then saving it as a draft. Then duplicate it through the event editor and update the name of the event to TEST or something easily recognizable. This will allow you to test out registrations for your event without adding sample/test registration records to your “real” event. Once you are finished testing, then you can trash the “testing” event. Important: You will now need to disconnect the testing/development app on the Event Espresso → Payment Methods→ QuickBooks page. There you will click on the Disconnect button. Then follow the steps in the next section to create your live app for accepting real payments with actual funds. 1) Click on the My Apps link, click on the app, then click on Keys. 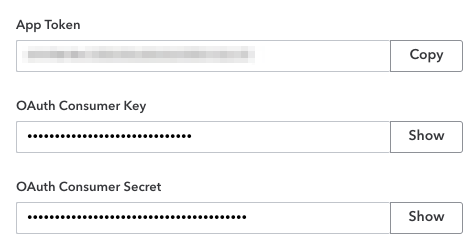 If you completed your account profile and verified your email address, then the Production section will display your API keys. If you have not updated your account profile and verified your email, then you will a message that says “Your production keys aren’t available until you complete the requirements below:” followed by a link to Complete your profile. Go ahead and update your profile with your information and then save changes. Next, go to your email inbox and click to verify your email address. Once you have updated your profile and verified your email address, then go to step 2 below. In the next section, leave your country selected and accept the terms and conditions by placing a checkmark in the box. Then click on Save. We recommend that you test payments in QuickBooks using your development (test) app. If you have skipped those steps, then we recommend going to the prior section above and setting up a testing app and connecting it to Event Espresso. If you were previously testing QuickBooks using your testing app, then it needs to be disconnected before you can connect your production (live) app. This can be done through your WP Dashboard (WP-admin) → Event Espresso → Payment Methods → QuickBooks → Connect to QuickBooks. Then click on the Disconnect button. Then follow the steps below when you are ready to accept production (live) payments. Then under Redirect URIs, you’ll add a URL and copy and paste your website URL into the Redirect URI field. Production URIs must use https, therefore an SSL certificate is required for production mode. 8) You will then see a prompt to authorize the connection between your site and QuickBooks. Click on the Authorize button. If you have multiple live companies, then select the correct company and complete the authorization. You are now ready to start accepting live payments! If you were previously testing QuickBooks and duplicated a “testing” event then be sure that event is not published or in the trash. This will ensure that it is not available for registration by your registrants/attendees. You can reset the expiry by going to WP-admin (WP dashboard) → Event Espresso → Payment Methods. Then click on QuickBooks and look for the Connect to QuickBooks area and click on the Disconnect button. Then click on the Connect button and then login. You may be asked to verify your account. Go ahead and do so and then click on the name of the company and finally click Authorize. Afterwards, you should see a green connected status with the updated expiry date. This expiry period of 6 months comes from QuickBooks and is not something that is set by Event Espresso. Will QuickBooks be the only payment method enabled or the only one you offer? Click here to learn how to make it selected by default during the registration checkout. A QuickBooks payment account is needed including QuickBooks Online is needed to accept payments through the QuickBooks payment method. Need an account? Sign-up for a QuickBooks merchant account to get started. A dedicated SSL certificate is recommended to make registration checkout and other areas of your website more secure. https is required for production. Through this documentation, we’ll be mentioning “QuickBooks” and “Intuit.” Note that QuickBooks is a brand by Intuit. It includes several services including accounting products, payment processing, and more. This payment gateway add-on will allow you to accept credit and debit cards through the QuickBooks payment processing service. Login to your WP-admin (WP Dashboard) and go to Event Espresso → General Settings → Payment Methods. Once on the Payment Methods screen, click on QuickBooks and click on the button to activate the payment method. Company ID – A unique identifier for your company. 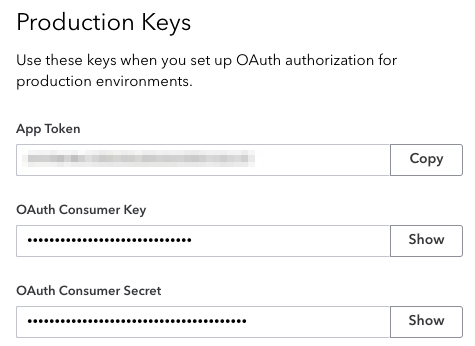 OAuth Consumer Key – This is generated when you create your app through the Intuit Developer portal. OAuth Consumer Secret – This is generated when you create your app through the Intuit Developer portal. The QuickBooks payment gateway will let you accept payments via major credit or debit cards. ACH (bank transfer) payments are not supported. This is an onsite payment gateway which means that attendees and registrants will process their payment on your site. A QuickBooks account is needed to accept payments via QuickBooks and an SSL certificate is required for production mode. I configured QuickBooks and payments are not being processed. Can you help? Are ACH (bank transfer) payments available? Credit and debit card payments are available through the QuickBooks payment gateway for Event Espresso 4. How can I set up a recurring payment or subscription through QuickBooks? Recurring or subscription payments are not currently supported in the EE4 QuickBooks payment gateway. When I refund a payment, does it also refund through QuickBooks? 2) Then login to your QuickBooks account and process the refund. Is an SSL certificate needed for QuickBooks? Compliance with the Payment Card Industry Data Security Standards (PCI DSS) is required if you are processing, storing, or transmitting credit card data. View more information on PCI compliance from QuickBooks.